Fran's excited about the outcome of her Chairperson Quilt, "Oh My Stars.". Monday, March 27, 2000, 6:30 PM. Giving Orphan Blocks a Home. 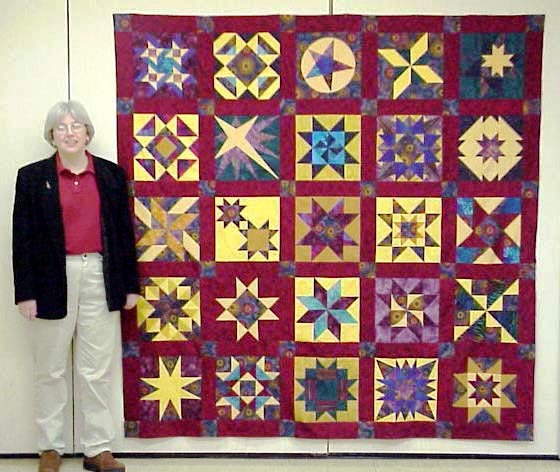 Please bring your odd, left-over, or one of a kind quilt blocks and strips to be pieced into a large quilt. Bring a few pieces of fabric to use in the background or to piece additional blocks if needed. Please bring your sewing machines. Monday, April 24, 2000, 6:30 PM. Creating Celtic Designs, by Elaine Frey. One ever-sharp pencil like the ultimate quilting pencil or another pencil with lead that doesn't smear. Two sharpie pens of different colors. Stay away from yellow because it doesn't show up. Elaine will provide an instruction sheet for each person, and tracing paper and patterns. She will also demonstrate bias tape appplication for those that have never done any stained glass type work. Gathering 2000, "A Pieceful Beginning," Saturday, March 18. This year's gathering is sponsored by the Heartland Quilters of Elkhart and will be held at St. Mary's College. Admission is $11. Dear Jane Retreat, Farmstead Inn, Shipshewana, April 27-29. April 29 through July 30, 2000. Indianapolis Museum of Art-Columbus Gallery will be exhibiting a collection of Marie Webster Quilts. Topeka Quilt Show and Sale, Topeka United Methodist Church corner of Pine and Babcock street in Topeka, Indiana. The show is Wed, June 21 10-5; Thurs June 22, 9-5; Friday, June 23 , 9-7; and Sat, June 24, 9-12. Quilts and items for show or sale should be brought to the Church on Monday June 19 or Tuesday, June 20 Between 9-4. This is quite a large show with many items for sale. Admission is $3, Exhibitors, free. All sales cash. NEXT MONTHLY BLOCK PROJECT. Please be thinking of ideas for a monthly block swap to replace the above swap which is coming to an end. If you are not caught up with your block commitment, please make an effort to get current. Fran also announced at the January meeting that we would like to consider adding a new position, that of Hostess, to our Maple Leaf Quilters offices. The hostess would be responsible for welcoming guests, providing information about Maple Leaf Quilters, answering questions about membership, and providing follow-up contacts with new and prospective members.